Fortunately, you’re not on your own. 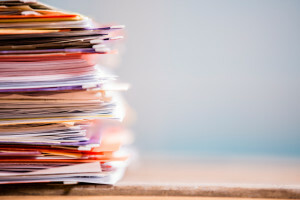 The National Federation of Independent Businesses, in fact, has done much of the legwork for you on developing a sound and coherent document retention policy. Note: Some states have passed a version of the Uniform Preservation of Private Records Act, that provides businesses some safe harbor to destroy most records after three years unless there is reason to believe that these records will be relevant to pending litigation, or unless there is a separate statute specifically calling for the retention of these records for a longer period of time. Florida, however, has not passed that law. For other readers, you can see if your state passed that law by seeing if it’s listed on this page (select your state from the scroll down menu).